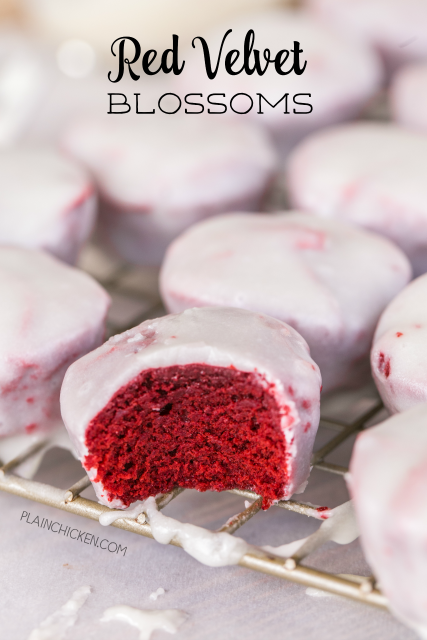 Red Velvet Blossoms - mini red velvet cakes dunked in a homemade cream cheese glaze. These things are CRAZY good! I ate WAY too many of these cakes. Red Velvet cake mix, chocolate pudding, oil, eggs, cream cheese, milk, powdered sugar. Make 5 dozen - great for holiday parties! Stop what you are doing and make these Red Velvet Blossoms NOW! They are SO good!! 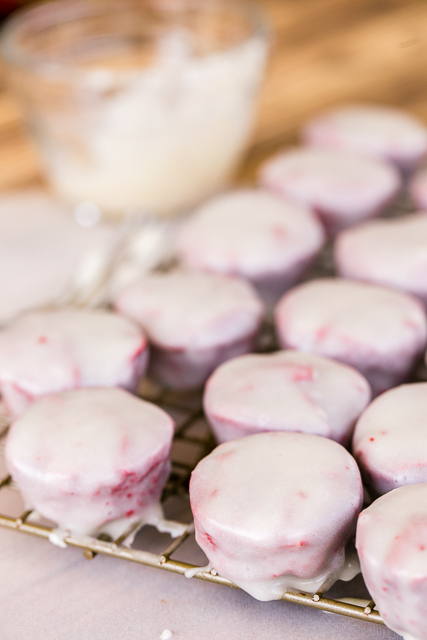 Little red velvet cakes dipped in a cream cheese glaze. It might not get any better than this! Seriously. I love bite-sized desserts and these Red Velvet Blossoms are some of the best I've eaten. The little cakes start with a box of red velvet cake mix. You do not make the cake according to the package directions. I repeat, do NOT make the cake. You are just going to use the mix. While the cakes bake, make the cream cheese glaze. You want to dunk the cakes in the glaze while they are still warm. I refrigerated the cakes after I glazed them. The recipe makes about 5 dozen. These Red Velvet Blossoms are great for parties or gift giving. I did "sample" a few (or about a dozen), so you might plan on having about 4 dozen to give away. Preheat oven to 350ºF. Lightly spray mini muffin pans with cooking spray. Set aside. Combine cake mix, pudding mix, oil and eggs. Mix well with an electric mixer until smooth. Batter with be thick. Pour batter into muffin pans, filling each muffin tin half way. Bake for 12 minutes. Remove from oven and turn over pan onto towel. They cakes will fall right out of the pan onto the towel. To make the glaze, microwave cream cheese for 30 seconds. Add remaining ingredient and mix with handheld mixer. Dunk warm cakes into glaze. Place glazed cakes on wire rack and let set for 1 hour. Refrigerate in airtight containers until ready to serve. how did you "dunk" your cakes? I dropped them into the glazed and fished them out with a fork. I put the fork on the bottom of the cake and shook off the excess glaze. What are you thoughts on mini muffins? Bite size! These are baked in a mini muffin pan. They are bite-sized. I made these last week and the taste was awesome, but I had trouble with the glaze. I followed the recipe completely, but my glaze was thick and more like regular frosting. It just clumped on the top like a mini cupcake. Did I do something wrong with the glaze? How could I thin it out? My finished product looked very different from yours. Please let me know how to fix it so I could make them again!